Contemporary stoves are becoming in creasing popular in the UK, offering a unique mix of the traditional charm of a fire in your home with contemporary design and sophistication that will look at home in the most modern of city apartments. Most of our contemporary multi fuel stoves are free standing, meaning that you do not need a fireplace to install them, They are designed to keep low temperatures at their base and be installed with a twin wall flue system, that can be used in any style of house or apartment even if you don’t have an existing chimney. 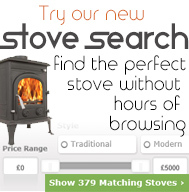 Our range of designer stoves are some of the finest available throughout the world and are a unique blend of technology, engineering and design. Sleek curves and attractive lines are the order of the day with modern designer stoves and this is exactly what you get with our range. Designed with the flexibility to either stand in the middle of the room and become a stunning centre peice or to be situated against a wall or even in a corner to save space these stoves can fit in with any room layout. Our contemporary stoves have extremely high efficiency ratings, making them practical as well as stylish and are far more efficient and environmentally friendly than gas, oil or electric for heating your home.You should notice your heating bill plumet once you start using a wood bunring stove and also be safe in the knowledge that it is less damaging for the environment too. On top of this nothing beats the charmy and cosey feeling that you get from a roaring stove. So if you are looking for an efficient, cheap and environmentally friendly way to heat your home and like the latest in style then our contemporary stoves may be just the job for you.